Given the hard times for the Mexican Micro, Small and Medium Enterprises (MSMEs), the government has put in practice several programs and stimulus packages in order to especially assist this type of businesses. In Mexico, MSMEs constitute more than 99% of all economic units, representing approximately 52% of the Gross Domestic Product (GDP) and 70% of all formal jobs. In the past, the Mexican government has used a traditional classification for defining MSMEs; the priority was the size of the workforce. However, with the intention of having a more accurate categorization for targeting the stimulus packages and anti-crisis programs, the traditional classification has just changed. 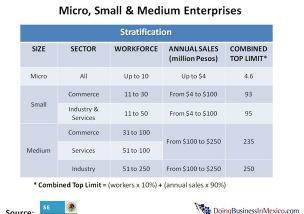 On June 30, 2009 the Economy Ministry issued a notice detailing the new MSMEs stratification system. When sorting the type of enterprise not only the number of employees are considered, but also the enterprise revenues. The goal is to avoid the discrimination of intensive workforce companies by excluding high-revenues companies from programs aimed for MSMEs. 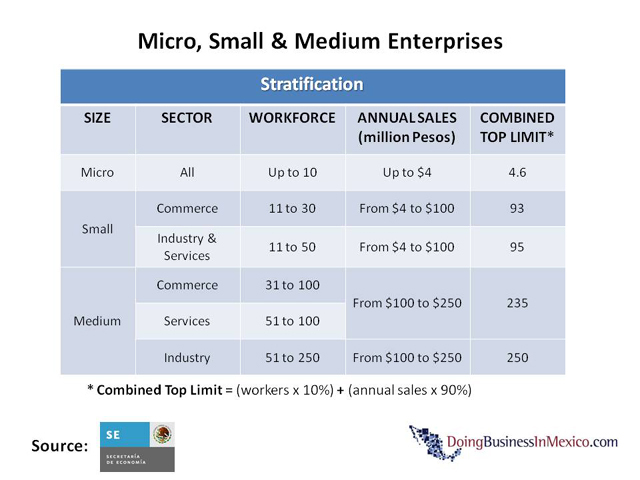 The new stratification of micro, small and medium enterprises is shown in the image. A combined top limit index has been developed where the Workforce is weighted by a 10% and Annual Sales are affected by a 90%. The size of the enterprise is obtained by using the combined top limit formula. The resulting number must be equal or below the category ceiling.